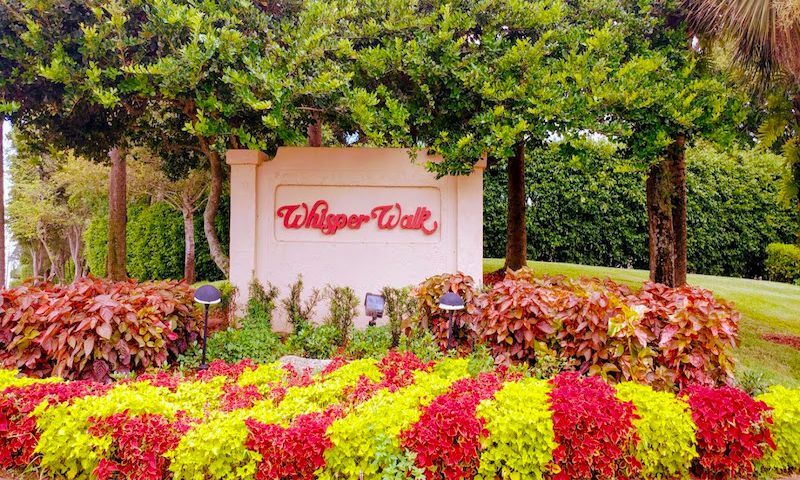 Whisper Walk is a 55-plus community located in Boca Raton, Florida. The community features attached homes with a low-maintenance setting. Active adults love the many private amenities, including shuffleboard courts, handball courts, and multiple swimming pools. Its location in Boca Raton is ideal for retirees and means homeowners are never far from beaches, entertainment, and shopping. Whisper Walk features several private amenities for residents to enjoy. There are five sections in the community each featuring its own set of amenities. That includes five clubhouses with multi-purpose rooms, five outdoor pools with spas, eight tennis courts, four pickelball courts, and eight shuffleboard courts. There are also four handball courts located at the center of the community. Construction on Whisper Walk began in 1993. Completed in 1994, the community includes 2,637 attached homes. These homes range in size from 1,000 to 1,921 square feet of living space. They include two or three bedrooms, two bathrooms, and one-car garages. These homes include features like screened balconies, first-floor entry, and expansive master bathrooms. Whisper Walk’s wealth of amenities allows residents to enjoy handball, pickleball, shuffleboard, swimming, and tennis. Residents can also host or attend BBQs or picnics. There are several social groups and events held throughout the community. The homeowners’ association fee covers outside maintenance including lawn care, exterior walls, and common space. This allows residents to spend more time with family and friends or on the many sport courts throughout the community. Boca Raton is a premier retirement destination for active adults. Residents can do their grocery shopping at Aldi, Winn-Dixie, Publix, or Whole Foods. Restaurants in the area include La Ferme, It’s All Greek, and Century Grill, and many others. The community is a short drive from many different retail stores including Best Buy, Ross Dress for Less, HomeGoods, and The Home Depot. Golfers are spoiled for choice being near Stonebridge Country Club, Southwinds Golf Course, Boca Greens Country Club, and Woodfield Golf Club, just to name a few. Medical services are provided by West Boca Medical Center, Boca Raton Regional Hospital, and Delray Medical Center. Whisper Walk is within an hour of many of the country’s favorite beach town, including Palm Beach, Boynton Beach, Hollywood, Fort Lauderdale, and Miami. Residents will have no lack of options when planning a beach day or a day on the boat. Other attractions in the area include Marikami Museum and Japanese Gardens, Lowe Art Museum, and numerous professional sporting events. Residents looking for a trip further away can fly out of Miami International Airport. With many amenities and an ideal location. Whisper Walk is a great 55-plus community for active adults in Boca Raton, FL. There are plenty of activities available in Whisper Walk. Here is a sample of some of the clubs, activities and classes offered here. These homes range in size from 1,000 to 1,921 square feet of living space. They include two or three bedrooms, two bathrooms, and one-car garages. These homes include features like screened balconies, first-floor entry, and expansive master bathrooms. My husband and I are winter residents for the last 3 years. Our home is beautiful. We love our neighbors. Whisper Walk is very impressive all around. It's well-maintained and looks like a park. We wish there were gates. We also would like to have more choices of activities from our clubhouse. Overall, we're very happy with our purchase and would recommend it to others. 55places.com is not affiliated with the developer(s) or homeowners association of Whisper Walk. The information you submit is distributed to a 55places.com Partner Agent, who is a licensed real estate agent. The information regarding Whisper Walk has not been verified or approved by the developer or homeowners association. Please verify all information prior to purchasing. 55places.com is not responsible for any errors regarding the information displayed on this website.